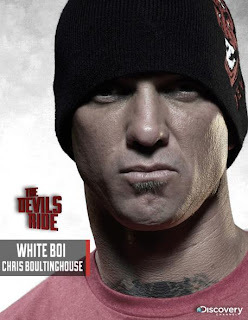 Cyberbodyshop.com: FULL Training & Nutrition Plan for Chris Boultinghouse (AKA "White Boi") from "The Devil's Ride"
FULL Training & Nutrition Plan for Chris Boultinghouse (AKA "White Boi") from "The Devil's Ride"
FULL TRAINING & NUTRITION PLAN BELOW! You may have heard of a newer reality show that premiers on The Discovery Channel called “The Devils Ride”. This show is now in season two, and features two separate “hard-core” motorcycle gangs who are in a constant battle to rule their territories. After a mediocre first season, the television producers for this show were looking for some “muscle” to spice things up, and while looking for the right person to do the job, they ran into our client and good friend: Chris Boultinghouse. Chris was recently released from prison after serving a seven year sentence. He has learned a lot, and is in a much better place now. After coming out of prison, and being offered an opportunity to star in this budding reality TV show, Chris realized that this would be a great opportunity to use his personal experience to earn some money while making a transition into the “real world”; and his new life. While the producers wanted Chris to be the “muscle” of the show, he was only a soft 180 pounds before the show was about to start filming. Despite what you may have seen in the movies, there are NO weights in California State prisons (they were taken out in 1991), and prisoners are fed a diet of poor nutrition (of course). While in prison, Chris survived on Top Ramen and white bread. His only protein came from the single slices of cheese and salami slapped between the empty calories of white bread. 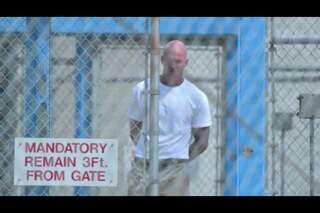 He was only allowed to come out of his prison cell for one hour per day to walk around the yard and do some light callisthenic exercises such as pull-ups, push-ups and bar dips. Needless to say, Chris lost quite a bit of muscle during his seven years behind bars. Once Chris was released, we put together a program that allowed him to put on a lot of muscle and drop body fat in 12 weeks. On the first day of shooting “The Devils Ride”, Chris was able to display a ripped 6’2”, 205-pound physique! We are so proud of Chris, and are so happy to have the opportunity to play a part in his life changing opportunity on this popular Discovery Channel show. Be sure to watch Chris in action as the “muscle” on Season 2 of “The Devils Ride”! Cardio: finish every weight training session with 30min of High Intensity interval Cardio. High intensity intervals means you walk for 1 minute then run hard for one minute then walk for a minute, run for a minute until your 30minutes is up. Meal 1: 1 carton Trader Joes’s egg whites. Scrambled with salsa. 1 Cup oatmeal. ½ cup blueberries.Multi-vitamin/mineral. Meal 3: same as meal 2. Meal 5: 8oz 96% fat free ground beef. Broccoli or asparagus.